This graph illustrates the impact that the filters inside many mobile devices have on Channel 14 signals: dramatic degradation. These filters are tiny devices that transform radio signals by allowing certain frequencies through but suppressing others. The y axis measures the attenuation, or suppression, of the signal. A more negative figure in decibels corresponds to a more attenuated signal. The x axis measures the frequency of the signal. At the high-frequency edge of Channel 14, the attenuation would be approximately 25 decibels — a reduction in signal strength of more than 300 times. 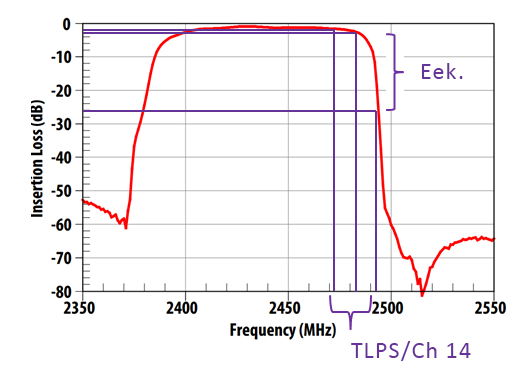 Note: purple lines and label added to Avago graph to highlight the level of typical insertion loss at the edges and center of a hypothetical 802.11n Channel 14 (2474-2494 MHz). On Monday, November 10th, we submitted a third ex parte letter to the FCC addressing Globalstar’s response to our October 10th and 22nd letters. To view the full comment, please click here. On Wednesday, October 22nd, we submitted a second ex parte letter to the FCC discussing results of our own testing and predictive surveys. The letter examines flaws to Globalstar’s tests, contrasts TLPS with real-world network at Canal Park, and shows how TLPS interferes with normal Wi-Fi. To view the full comment, please click here. [Globalstar’s] “test” is ludicrous, non-realistic, non-professional, and would be laughed at by 100 out of 100 wireless professionals. On Friday, October 10th, we submitted an ex parte letter to the FCC discussing Globalstar’s planned TLPS. To view the full comment, please click here. First, we acknowledge that we inadvertently misattributed a quotation in our report and presentation. The discussion of “that sinking feeling set[ting] in” when Globalstar management first read the FCC’s NPRM was L. Barbee Ponder’s, not Jay Monroe’s. We apologize for the error and will correct our materials accordingly. On Monday, October 6th at 11:30am ET, Sahm Adrangi, Chief Investment Officer of Kerrisdale Capital, will host a live presentation on a multibillion-dollar company that we're short. This is the best short idea Mr. Adrangi has come across during his time running Kerrisdale. The equity is fundamentally worth zero and we believe that we clearly and irrefutably demonstrate that the business is insolvent. Over the past several weeks, we have written a multi-part series about the perils of investing in specialty retailers, particularly those in undifferentiated formats. We strongly encourage readers to review our first three articles on Five Below (FIVE), each highlighting a different aspect about the risks of the specialty retail sector.